Failure mode effects analysis (FMEA) is a tool you can use in Six Sigma to quantify and prioritize risk within a process, product, or system and then track actions to mitigate that risk. It’s valuable as a method for identifying and prioritizing which critical few factors you must address to improve the process in your DMAIC project. It’s also great for developing and carrying out the associated improvement plans. An FMEA is a tabulated list of the process steps, with each step’s potential failure modes (ways in which the process step may go wrong or not produce its desired/required outcome); its associated effects and causes; how often the causes occur; and how well the causes are controlled, prevented, or detected. It basically looks like a large table. The rows in the FMEA table correspond to individual steps of the process you’re analyzing. 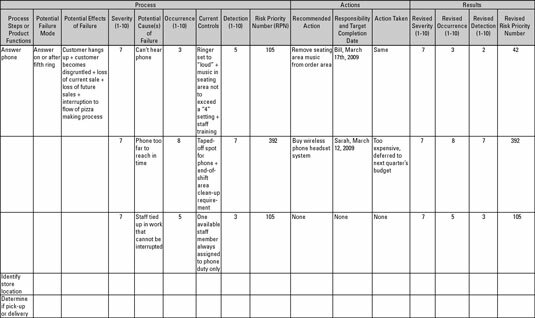 As you read from left to right in the table, you transition from listing the process step to that step’s potential failure modes, the potential effects, the potential causes, and the current detection or prevention controls. For each row, you also provide a score for the severity of the effect, the frequency of occurrence of the cause, and the effectiveness of the current controls to detect or prevent the cause. The product of those scores creates the risk priority number (RPN). For a Six Sigma DMAIC project, you should start an FMEA after you have defined the project and you have an initial understanding of the current process. An efficient FMEA effort doesn’t try to start from a blank slate. Instead, it relies heavily on the previous completion of a process map of the current state. Other resources that you can feed into an FMEA include compiled performance data from the process, fishbone diagrams listing potential process factors, existing process instructions or standards, and so on. Although the overall flow of an FMEA is straightforward, the effectiveness of the method lies in rigorously following the guidelines for each of the detailed elements in order. To check whether you’re on the right track with your process step listing, look at the grammatical construction of the steps; each listed process step description should generally begin with a verb and end with an object: “Machine outside diameter of part,” “Enter customer address,” and so on. Using the verb-object grammar check helps you make sure that your process steps are granular enough to properly identify risks. If you’re doing an FMEA centered on the function of a finished product rather than on the execution of a process, just list each of the required product functions rather than the process steps. For each process step, you must first think of its requirements. Identifying the process step’s requirements is an intermediate step to accurately and comprehensively identifying the step’s potential failure modes. The requirements are the additional criteria that determine the success of the step’s execution. In the pizza order taking example, the first step is “Answer the phone.” What is the requirement for this step? An employee may answer the phone after it rings for five minutes, but that likely isn’t the level of customer service the restaurant is shooting for. The requirement therefore may be to answer the phone before the fifth ring. Take care not to get sidetracked by failure modes that aren’t related to the requirement for your listed process step. For example, a failure mode of “Phone call sound quality is poor” may be legitimate, but it’s not at all related to the “Answer within five rings” requirement. These other requirements will be captured properly and detailed in another section of your FMEA. The next step in the FMEA is to list the potential effects — yes, that’s plural effects — of each identified failure mode. Simply list each individual effect in the same cell of the FMEA table, separating each individual effect with a + or an &. To help think of effects, consider two aspects of the failure mode: First, think of how the failure mode may affect the flow of the process and internal customers; second, think of how the failure mode may affect the end customer of the process. Pretty soon, you get into the groove and can quickly create a comprehensive list of possible effects. Looking at your list of potential effects, you need to determine how severe of an impact the identified failure mode may have. You use a 1 to 10 scale, with 10 being the most severe impact and 1 being the least severe. The first column shows the numeric scores; the second column is a verbal description of typical industry-standard levels of severity from the Automotive Industry Action Group (AIAG), and the third column translates that AIAG language into more practical, customer-centered terminology. For the combined list of effects in the pizza example, the FMEA team needs to assign a score to each listed individual effect and then give an overall severity score based on the worst possible individual effect.